There is more to our evolutionary history than a single origin in Africa. In the past year, at least four fossil finds have been billed as overturning the story of human evolution. The 300,000-year-old Homo sapiens specimen from Jebel Irhoud, Morocco, is hailed as pushing back the age of our species by nearly 100,000 years. Similarly, discoveries in Israel (a fossilized jawbone), Saudi Arabia (a fossilized finger bone), and Siberia (several bone fragments) were each declared to be the oldest H. sapiens in their respective regions of the world. With each new find, researchers and news headlines announced that the fossils significantly altered our understanding of human evolution and dispersal from Africa. But if we have to rewrite the story of H. sapiens evolution so frequently, we might ask whether the plot we’re using is wrong to begin with. The dominant, almost axiomatic paleoanthropological narrative holds that anatomically modern humans evolved in sub-Saharan Africa 200,000 years ago, and considers any fossil find relative to that framework. So, the Jebel Irhoud cranium from Morocco was reported as pushing back the origin of our species and making it a pan-African phenomenon (Hublin et al. 2017); the Israeli and Saudi specimens were said to push back the timing of the dispersal out of Africa (Hershkovitz et al. 2018; Groucutt et al. 2018); and the Siberian fossils were called the oldest modern humans outside of the Middle East and Africa (Siberian Times 2018), despite older findings (and similar headlines) from China, Laos, and Indonesia in the last 10 years. In essence, the data are subservient to the narrative that an entity known as anatomically modern humans exists and has a singular origin. Yet, this story ignores the complex fossil records of Asia and Australia and perpetuates a distinctly Eurocentric vision of our past. The phrase “anatomically modern Homo sapiens” was first used in the 1970s to distinguish between Neanderthals and the European hominins who looked more like us. It wasn’t meant to establish a formal species boundary. But, in 1987, when Cann, Stoneking, and Wilson published their mitochondrial DNA study tracing all living humans back to a single ancestral population that lived in Africa around 200,000 years ago, molecular anthropology took on a new significance in the story of human evolution. After that, all non-African Middle and Late Pleistocene populations—including European Neanderthals as well as Homo erectus in Asia—were considered evolutionary dead ends. Despite the lack of consensus on this model among fossil experts and population geneticists, it has become the prevailing wisdom in a generation of anthropology textbooks and introductory lectures. The entire narrative of H. sapiens evolution requires revision every time there is a new find not just because science is self-correcting, but because the current scientific model is fundamentally flawed. Within this framework, paleoanthropologists have aimed to locate where the first so-called “modern” humans evolved during the Late Pleistocene and to trace their subsequent path across the globe. 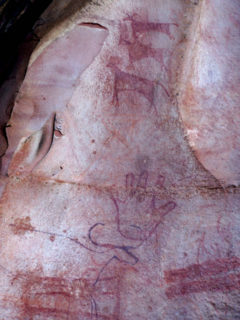 This presumes two things: First, that there is a “first.” And second, that there is such a thing as a “modern human.” Based on these presumptions, paleoanthropologists, Paleolithic archaeologists, and anthropological geneticists have sought out the earliest signs of biological or behavioral “modernity.” Each subfield defines this differently. Biological anthropologists focus on anatomical modernity—high foreheads, reduced browridges, and globular heads with small faces. Paleolithic archaeologists have emphasized evidence of complex or abstract thinking in the form of art, burials, toolkits, or social/organizational complexity. Geneticists have honed in on genomic signatures that separate us from Neanderthals and unite us with living populations. The problem is that these criteria are not nearly as universally recognized or scientifically repeatable as we’d like them to be. First, there is ample evidence that the evolution of our species was not a singular event with a “first” member. Biologically, there is no consensus definition of what constitutes anatomical modernity, just as there was never any agreement on what criteria should be used to define “races.” Behaviorally, evidence of complex or abstract thinking reveals itself in ways that we either overlook or can’t know because we are restricted to how these appear in present-day contexts. For example, stone tools from the Batadomba Lena rock shelter in Sri Lanka (Perera et al. 2011) and pelagic fish remains from the Jerimelai rock shelter in East Timor (O’Connor, Ono, and Clarkson 2011) show that humans successfully exploited rainforest and deep-seawater resources in Australasia 40,000 years ago, meaning these populations clearly had an understanding of astronomy, oceanography, or rainforest ecology that required abstract knowledge of a different form than we see in Europe. Since stone tool technology is a response to local environmental vicissitudes, constraints, and needs, it shouldn’t be expected to follow a linear pattern of development for all humans. So, to reduce H. sapiens evolution and behavior to the binary of “archaic” and “modern” and then search for the first appearance of the latter in our biology or artifacts is an exercise in essentialism. Membership in each is based on Eurocentric notions of what constitutes humanness, not on criteria that have been objectively defined and can be empirically uncovered exclusively through the scientific method. The entire narrative of H. sapiens evolution requires revision every time there is a new find not just because science is self-correcting, but because the current scientific model is fundamentally flawed. The site I work at in India provides a chance to reconfigure how we study H. sapiens evolution and address the inherent biases that have been baked into this topic from the beginning. 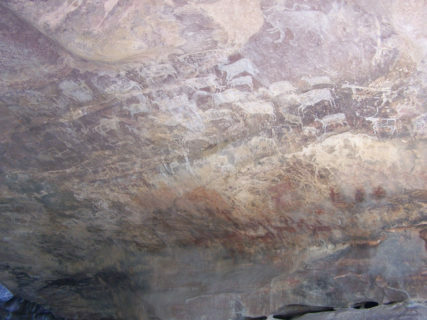 The Bhimbetka rock shelters are situated in the Vindhyan Hills of Madhya Pradesh, Central India, and preserve paintings and burials that appear to be early Holocene, based on the images depicted and preliminary radiocarbon dates taken in the 1970s. The late V. S. Wakankar excavated the shelters at that time. I have always known about the site but didn’t think much could be done there because the skeletal remains were too fragmentary to give any clues about morphology. Plus, most of the stone tools were microliths which, based on the European/Near Eastern model, are associated with the proto-agricultural Mesolithic period and between 12,000 and 8,000 years old. This is fairly young in terms of H. sapiens evolution. A few years ago, I started delving into the details of these materials for a new collaboration I was forming with Mattias Jakobsson, an ancient DNA specialist at Uppsala University. The morphology I read about intrigued me. The most complete skeleton had a few features that we’d consider “archaic” in the binary model including thick cranial bones, a low, sloping forehead, and a huge jaw with large teeth. It wasn’t directly dated, but some of the stone tools associated with it were, in the European model, typical of Neanderthals and usually found in contexts older than 40,000 years. Another thing that struck me was that in the past 10 years, the microliths used to date the site to the Mesolithic had been found in several sites in India dating to between 40,000 and 70,000 years ago. Microliths aren’t seen in Europe or the Near East until the dawn of agriculture and have always been assumed to be a technology that developed in conjunction with that subsistence pattern. But with the new data from India, their presence at Bhimbetka didn’t necessarily mean that the site was Mesolithic; I realized it could be older. Our research at Bhimbetka now centers on filling in some gaps in the paleoanthropological record in a way that doesn’t start with the assumptions of the Out of Africa model. We aren’t seeking to find a “first” or to overturn the story of human evolution; we’re seeking to make the evolutionary narrative more inclusive. The question in South Asia has typically been, Where did microlithic technology come from? Was it brought into India by dispersing modern humans from Africa, or did it develop indigenously? But this very question is Eurocentric—it assumes that Indians in this scenario are “archaic” humans and were not likely to have developed microlithic technology themselves. It also misses the more informative question regarding these stone tools, which are also found in Southern Africa and Australia before the Holocene and are clearly not uniquely associated with the advent of agriculture: How did this technology mediate human adaptation to different environments at different times? Similarly, the craniofacial anatomy at Bhimbetka tells us that there is no such singular entity as an “anatomically modern” human. Although the individuals there are robust, and have sloping foreheads as well as brows that are more prominent and skulls that are less globular than your average Eurasian, there is no reason, based on age or morphology, to classify them as anything other than H. sapiens. To examine their features exclusively within an archaic/modern binary is a typological and essentialist question focused on classification, not evolutionary history. Instead, in our project we are looking at the mechanisms that shape the human body, namely habitual behaviors combined with evolutionary forces such as gene flow (which can make two populations look more alike) and adaptation. Genetically, we are interested in how these early populations share markers with present-day Indians but also with other prehistoric groups from the neighboring regions of East Africa, the Near East, and East/Southeast Asia. These can help us trace paths of gene flow or migration. The most exciting part of this project for me is the chance to study the Bhimbetka data relative to a different set of questions that aren’t driven by the Out of Africa narrative created by western scholars. We have the rare opportunity to definitively associate stone tool types with biological remains of humans in India, and provide a direct date for them. By doing this, we are shifting the questions away from the essentialist associations that have historically been made between “modernity,” stone tool types, and morphology, and toward a more inclusive inquiry into the varied ways that morphological traits, genomes, and stone tools co-occurred in different regional populations of early H. sapiens. Our analysis of the Bhimbetka material is preliminary, but we are aware that not all South Asians want to know when Africans first peopled their subcontinent, in part because they haven’t dismissed the data that reflects a strong level of regional continuity in occupation and evolution in South Asia throughout the Pleistocene. Instead, we will focus on questions of relatedness between present-day Indians and these past populations, and will also explore population movements into and out of the subcontinent—events that have shaped it for millennia. One reason for our reframing of the dominant model and questions is that my co-principal investigator, Ravi Korisettar, and I are South Asian. Reviewers and colleagues tell me that our perspective exhibits an Indian ethnocentrism, but do western scholars recognize the ways in which their own ethnocentric biases continue to shape the discipline? We believe that the act of bringing this alternative perspective into paleoanthropology is necessary for the healthy development of the science. The National Science Foundation and Wenner-Gren Foundation realize this, and are supporting research such as ours. Rather than dismiss our Asian colleagues as ethnocentric, we can integrate their perspectives, explore different patterns of H. sapiens evolution in different regions, and acknowledge different modalities of ascertaining paleoanthropological facts. Paleoanthropological models have historically been constructed in something of an echo chamber; we need to include more diverse voices in the development of our scientific research to improve the quality of our outcomes. My wish is that we do more for non-western communities than treat them as passive recipients of our “broader impacts” (doing the science and then going back and lecturing people on what we found out about them). We should include them as participants in study design and question formulation, and as contributors to our background/theoretical framework. Ultimately, inclusiveness means yielding space for other voices, forms of knowledge construction, and ways of performing science, and integrating this into the study so that multiple world views are represented at all levels of a project. Only by doing so can we truly excel at our goal of understanding our species’ evolutionary past. Sheela Athreya is an associate professor of anthropology at Texas A&M University. Her research focuses on Middle and Late Pleistocene human evolution, particularly in eastern Eurasia. Her publications include empirical analyses of hominin fossil data as well as reflexive analyses of the effects of colonialism on present-day paleoanthropological models.